Located in the northwest of the Java Island, Jakarta, the largest city and capital of the Indonesian archipelago offers a unique and lively holiday. Here are some places and monuments not to be missed during your stay in Jakarta. By visiting Jakarta, do not forget to soak up the atmosphere that prevails there. Schedule a visit to the local shops without forgetting the luxury shops. Do not miss to discover the nightlife of the city. Passing in Jakarta, tour Ancol Dream Park, a famous park in southern Asia, is required. This large complex includes resorts, a private beach, a hotel, restaurants and a large marina. This is one of the largest parks in the whole of Asia. During your trip to Jakarta, allow passage through the theater Gedung Kesenian Jakarta. Neo-Renaissance style building, this theater has been fully restored. You will be able to attend performances by Indonesian artists or by international artists. Enthusiasts of art and history will stop at Wayang Museum but also the National Museum of Indonesia. 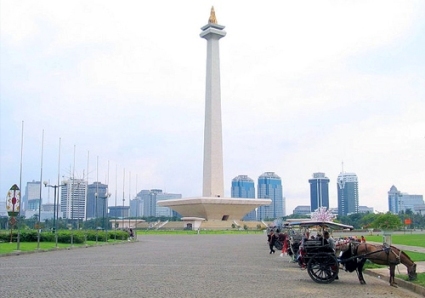 Do not forget to visit The Freedom Square which Monas houses (Monumen Nasional), a symbolic monument of the country. Around this 137 metres high Obelisk are the national museum, the Presidential Palace and the Istiqlal Mosque. Kota, the historic district, is also essential. There are several ancient monuments including the ruins of the old Batavia that unfold around the Fatahillah square. Finally, there is the Golden Triangle, the modern area of the city. Here finds prestigious hotels and embassies. One discovers there large avenues bordered by the business district.